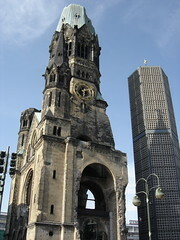 The most striking building on Kurfürstendamm, Berlin's most exclusive shopping street, in the half destroyed Kaiser-Wilhelm Memorial Church (Gedächtnis-Kirche). Initially, there were plans to demolish the church to make place for a new one, but due to public pressure this did not happen. 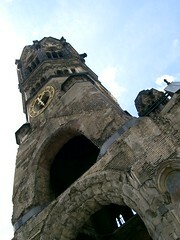 Instead, the church stands were it always has, with its bombed out tower - a constant reminder of the Second World War. Today, the church is a memorial hall, where visitors can still see the ground floor interior of the church as well as see before and after shots, and learn more about the history of the church and the surrounding area. Guided tours are also available a few times per day except on Sundays. Even though the old church was never demolished, a new one was built. Standing in stark contrast just beside the original is the new church, designed and built in the 1960s. The new church actually comprises of four buildings, placed around the original church. The largest of the buildings is octagonal in shape and inlaid with thousands of stained glass sections, it can look somewhat strange from the outside, the view from inside the church is truly impressive. During advent, a large Christmas Market takes place on the square around the church, which normally runs until a few days after Christmas itself. Way back in November 1959, as a student tourist, visited Berlin. Saw the bombed-out church from close quarters. Was not allowed to go inside the church. could easily travel in the U-Bahn, get off at Friederich Strasse stop, and walk across to East Berlin for a little (disappointing) sight seeing. 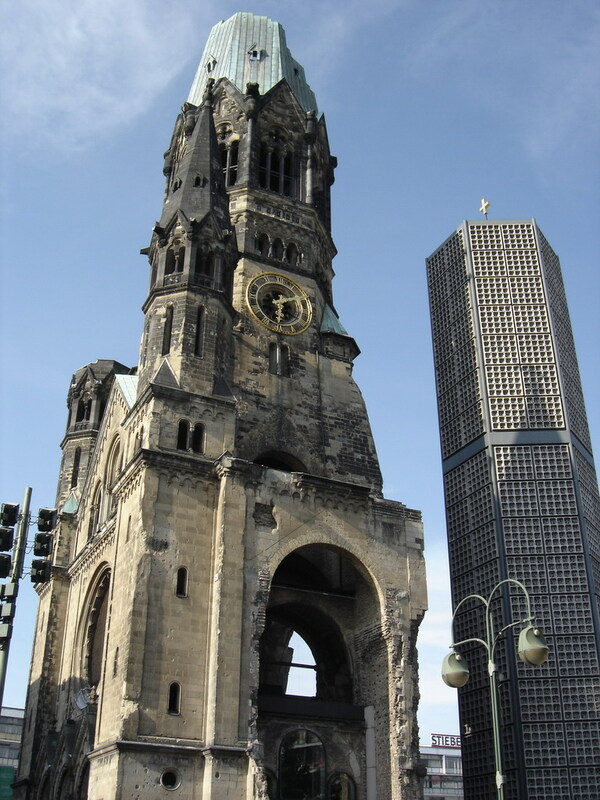 During subsequent two visits to Berlin in the 70's saw the church again, standing on bustling K'Damm. Unforgettable. Have you already visited the Gedächtniskirche (Memorial Church)? If so, let everyone know what you thought about it by writing a review! No registration necessary. Just click here to start writing! 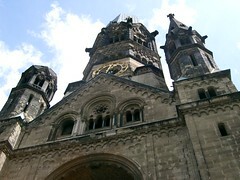 View all Gedächtniskirche (Memorial Church) Pictures.